Today, a few pictures from the ESNG N-mod layout. Most years, we’ve put together a continuous run layout. However, in 2016, I was having some difficulty thinking how to fit in Azusa Mills, that is an L-shaped layout (pictures in a later post.) It suddenly occurred to me that if we put together an L-shaped N-mod, Azusa Street could complete the square in the middle of the main hall. So that’s what we did. The canal on our speedometer board looks very relaxing and very appealing during a hectic show day. It’s become an ESNG tradition for Eric the Roundhouse to appear in a different guise at each show we go to. On Saturday it was Eric the Permanent Way Depot. In previous years we’ve had Japanese Eric, Lehigh Valley Eric, Class 73 Eric, Taurus Eric. We could probably do a Stroudley Terrier Eric, if we borrowed them from all the club members. You get the idea…. Triangle junction can form a connection out to a double track branch or N-club modules. The playing field by the church is reversible. It’s usually a scout camp, but has been known to contain a crashed UFO. The fiddle yard is always worth a look as it contains a good selection of trains ready to run. The operators this year did well by swapping trains on and off the layout all day, giving even more variety than out 13 track fiddle yard can do on its own. Another reversible special from Derek – market garden or suburban estate? We were pleased to exhibit Lowater Basin, Martin Mickewright’s canal module, represented a preserved canal basin, as Martin is unfortunately in hospital. A London Transport Pannier passes on the mainline, pulling a Pullman excursion – really, Michael, who are you trying to kid? 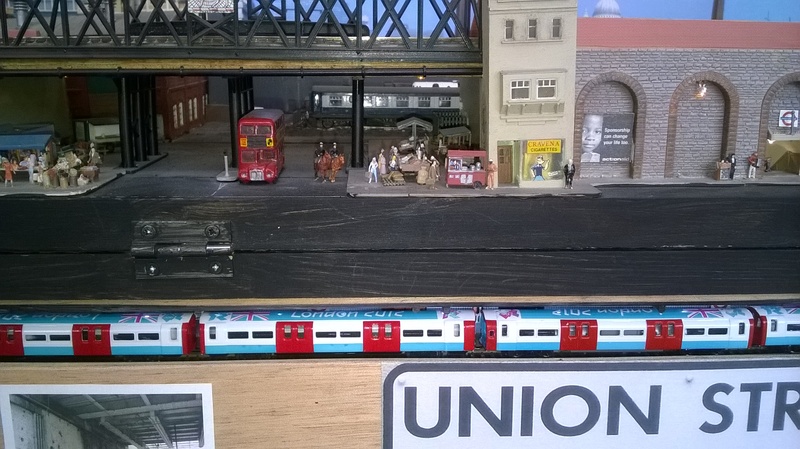 But of course, Rule 1 applies – it’s my railway! Union Street always has something to look at, be it the street market, the bouncers doormen outside the disco, or the Underground service. The operators….. Michael and Ian look a bit worried about something. One reason I enjoyed my day as it was a real family occasion. Son Michael was operating the N-mod, whilst wife Maxine and Chelle my younger daughter worked very hard on catering. It’s unusual for my family to be rash enough to share my hobby. Next post, we’ll have a few more shots of people. WHAT A MEETING! AND THE CANAL SCENE GIVES ME INSPIRATION FOR THE CANAL SCCENE I’D LIKE TO DO!